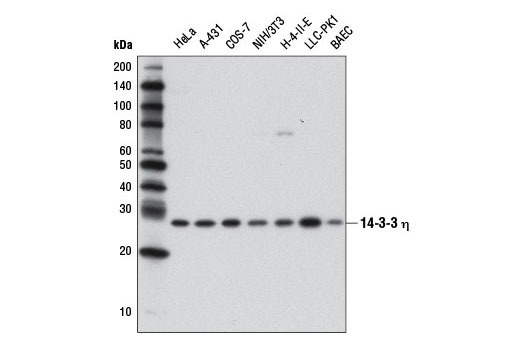 Western blot analysis of whole cell extracts from various cell lines using 14-3-3 η (D23B7) Rabbit mAb. Isoform specificity of 14-3-3 η (D23B7) Rabbit mAb. 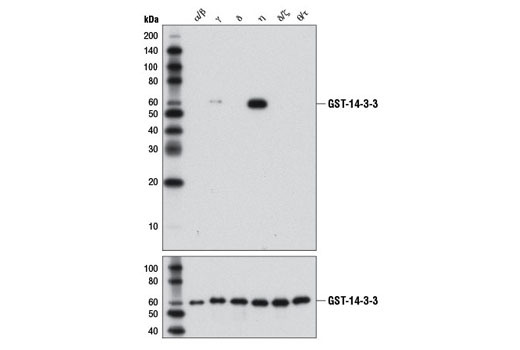 Recombinant, purified, GST-tagged 14-3-3 protein isofoms (2 µg each) were resolved by SDS-PAGE, transferred to nitrocellulose and blotted with either 14-3-3 η (D23B7) Rabbit mAb (upper) or GST (91G1) Rabbit mAb #2625 (lower). 14-3-3 η (D23B7) Rabbit mAb recognizes endogenous levels of total 14-3-3 η. This antibody shows weak cross-reactivity with 14-3-3 γ but does not detect any other 14-3-3 family isoforms. Monoclonal antibody is produced by immunizing animals with a synthetic peptide corresponding to residues surrounding Leu37 of human 14-3-3 η protein.